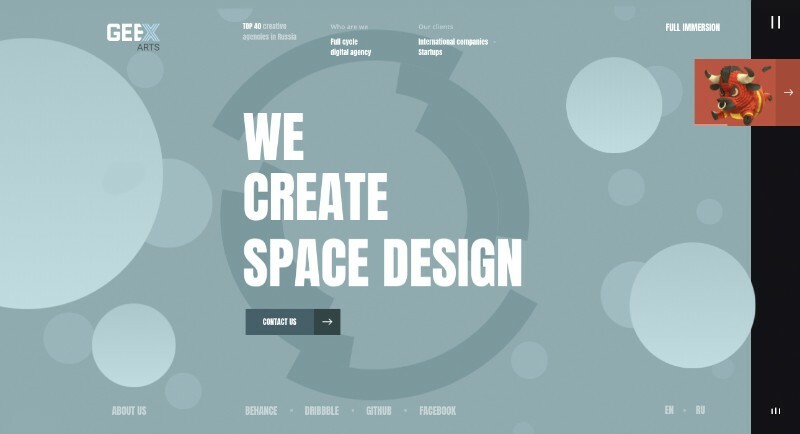 Is it time for you to design agency website but you are not sure where to start? Well, first you need to understand the importance of creative website designs that will help you create the best agency website possible. After all, your website is one of the easiest ways to communicate with your customers. The users’ first contact with website design agencies is often through their websites so you want to make sure they will have the best possible experience when visiting your web agency. From a well-designed webpage to easy navigation, there are many details that you need to pay attention to when designing an agency website. So let’s take it one step at the time and take all look at what the best agency websites have all in common and how to design the best website in the universe. Top agencies know that having a well-designed home page is your chance to make an outstanding first impression and to attract and engage your potential clients. Website agencies should let the users know what it is that they do as soon as possible to ensure the users they have come to the right place. However, keep in mind that you should keep it brief because if the first thing the user sees on your home page is a huge bulk of the text, there is a good chance they will immediately click away and visit some of the other top voted websites. A web design agency should always put their best work on display. Not only will it help the clients know what to expect but it can also help establish the trust between innovative agencies and the clients. Again, keep things brief enough to get the users’ attention and to compel them to learn more about you without burying them in a bunch of text. Best agency websites don’t only put their best work on display but they also use clients’ testimonials as a direct proof of the quality of their work. Satisfied clients are the best salespersons on best company websites and most website development agencies know it is best to make those testimonials and praises immediately visible on a home page. The purpose of your home page is to introduce your website agency to the new people so you have to make the most out of your own content. Including things like images, videos, blogs, news, and similar is always a good idea for creative agencies that want to make innovative websites. 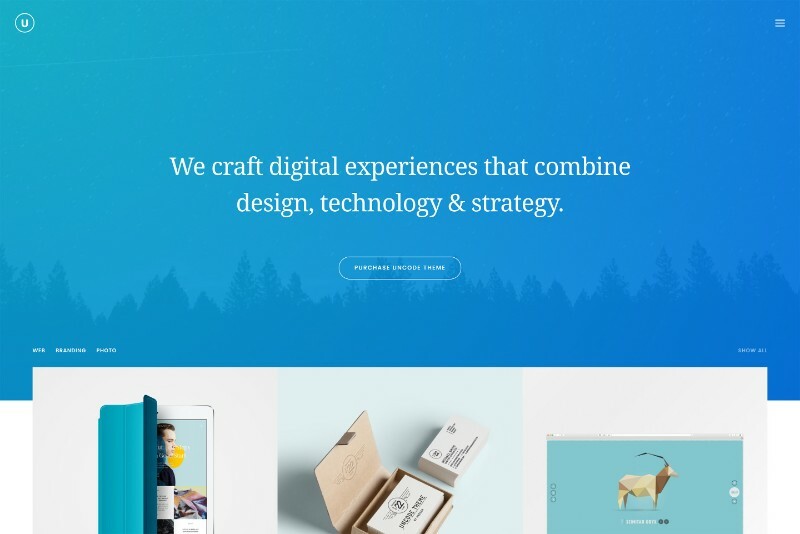 If you check out any currently popular web design studio and their agency website, you will surely get plenty of inspiration for choosing your own content for your homepage and your own innovative web design. When designing creative websites, it is important to define your default styles and then keep things consistent. Elements such as body, links, headings, paragraphs, quotes, and list items can be stylized using Webflow and you can always restyle them to best fit your needs. A Collection is basically a data set that you will be able to use in multiple places throughout your agency website. You can use it, for example, to set up an “Our Team” page, including content such as the individual team members’ name, profile picture, bio, job title, contact information, and so on. By grouping information and creating collections, you can make things much easier to find on your website, not just for you as the developer or the owner of an innovative website, but for the users as well. It is ok to set a friendly tone on your web agency, but you should cut the jargon and keep the language formal or semi-formal if you want to be taken seriously. Top design companies never use jargon when trying to attract serious clients so keep that in mind if you want to make it to the top 10 website designs companies. Whether you want your agency website to have a playful tone, a cool one, or a serious and formal one is entirely up to you. Think about the best way to approach your potential users and then set the right tone according to that when creating your own most creative web site. Linking channels such as social media accounts or blogs is a great way to keep in touch with the clients and to have a better and more open communication with them. Make the links clearly visible and help your potential clients get to know you and get in touch with you on a more personal level. Best creative agencies usually have the links visible directly on the homepage, as well as on the Contact Information page. If you own a website design agency, you need to use your strengths turn your own agency website into your best marketing tool. When the user first glances at your creative website design, they should immediately want to have a website just like yours. There are many design agencies out there, so you need to make sure that your website really stands out for all the right reasons. This is how you get the best marketing websites. If the visitor repeatedly gets lost on your website, there is a good chance you will lose them. Keep things simple and make the website easy to navigate rather than complicating things by adding too much stuff. While it is good to take a creative approach, keep in mind that the user expects things to work one way and if you choose to go the opposite direction, there is a chance that the user will quickly get frustrated. Web design agencies are first and foremost made of creative individuals; you should use that to your advantage and introduce your team to the potential clients because people like working with people. Making things more personal by posting pictures of your office and of people working there is a good way of earning the users’ trust and becoming automatically more likable. Creativity – How to Do It Right? Being creative is always a plus when designing awesome websites. However, you need to know how to balance your creativity with the website’s practicality and usability. For example, if you get a bit too creative, there is a good chance your most creative websites will also turn out to be the most confusing ones. You should never sacrifice practicality and usability for the sake of having a unique design because it will indeed stand out – but for all the wrong reasons. 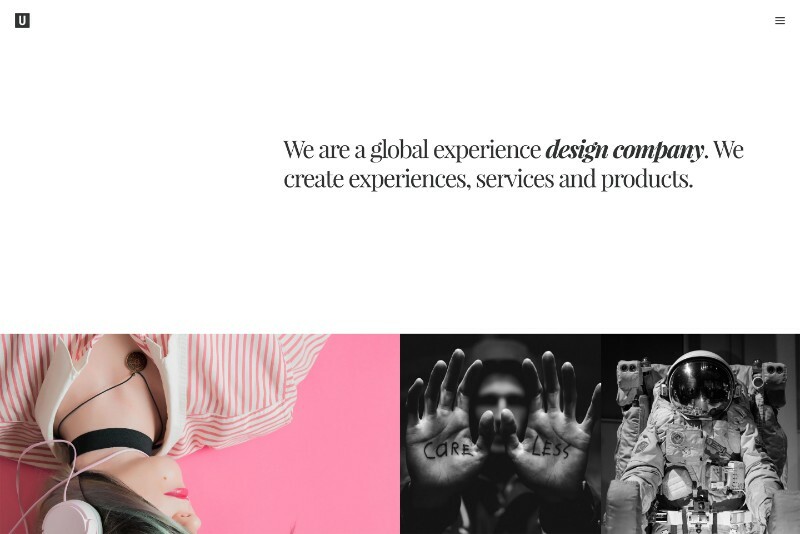 If, on the other hand, your unique ideas don’t compromise the website’s functionality, you are on a good path to becoming one of the top design agencies if not THE top creative agency. 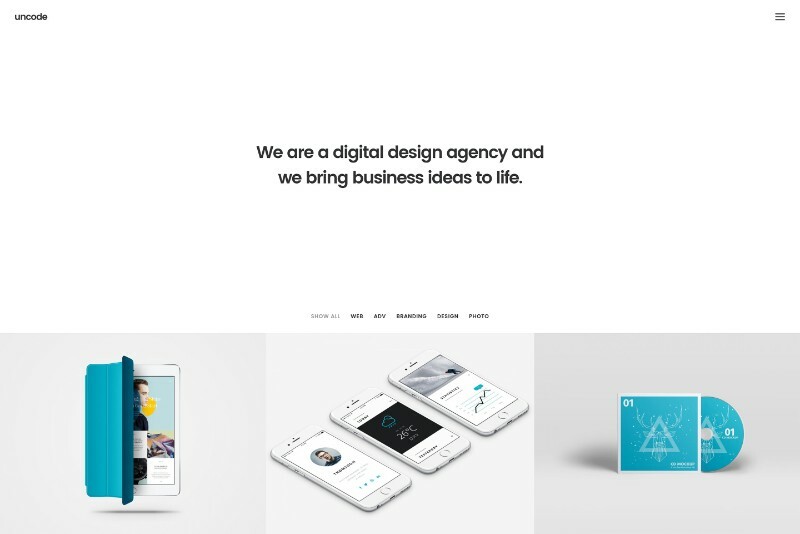 When designing an agency website, you need to think about all the elements that will make your website stand out while also catching the potential clients’ attention immediately. A well-considered online presence is what can make or break your business so it is not something to be taken lightly. Considering the value that is assigned to your future website, it is always a good idea to delegate some of the responsibilities to a professional. 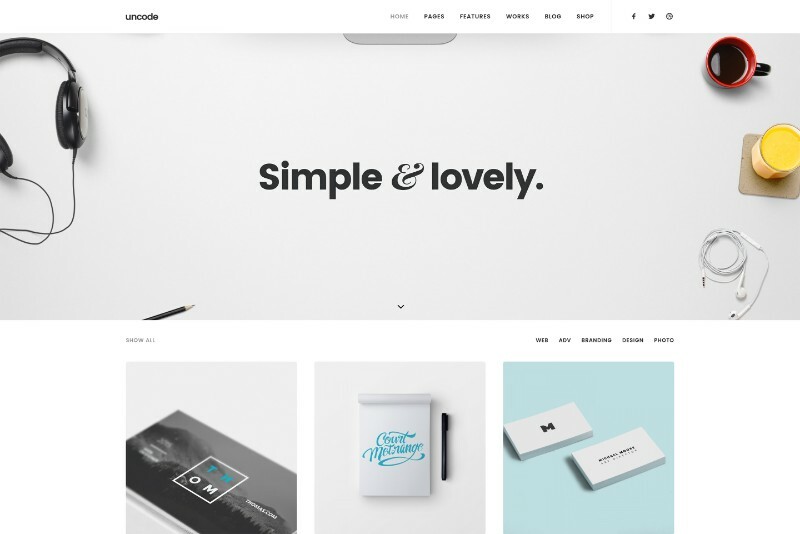 Uncode takes this task seriously – thanks to its numerous unique features and options, this high-quality WordPress theme allows you to build a beautiful and creative website in no time. 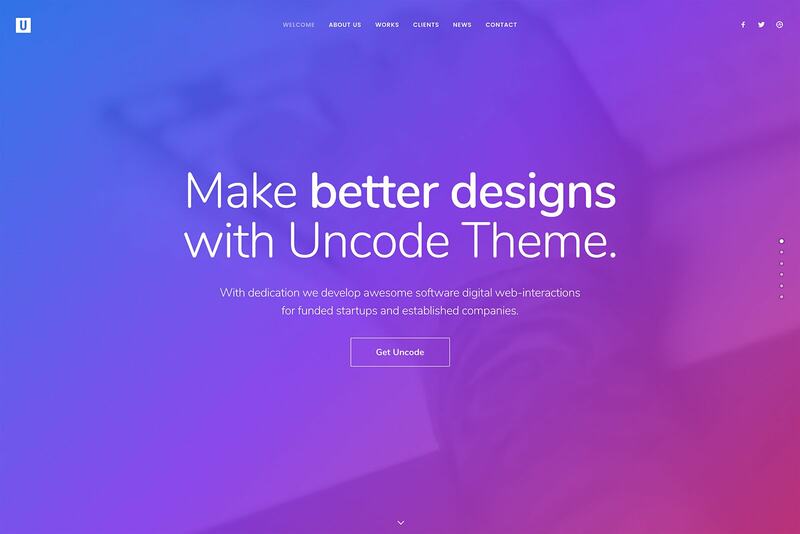 Uncode gives a perfect opportunity for its users to tailor the features according to their needs, thus adding a splash of individuality to each created website. Do not wait – let your creativity play around with Uncode’s media carousels for that perfect presentation of your work. Also, you would definitely want to check lightbox options that are specifically created for designers and developers.